Satcom connection, for web browsing and email, is possible throughout MENA via direct two-way transmit-receive customer dishes, called VSAT terminals. In recent years, new Ka band service, using small spot beams offer attractive pricing for home and small office user. Fast web page downloads, email, ftp file transfers and streaming video and audio are achieved with speeds of up to several Mbit/s, using a share of a high bandwidth connection from a large teleport hub. 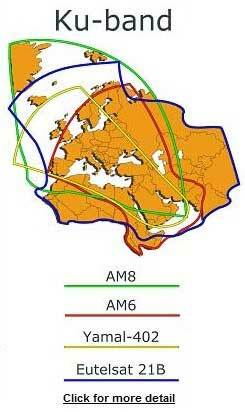 Teleport hubs are located in MENA and Europe. Upload, return path, rates may be up to 1 Mbit/s if required. Satellite broadband capacity is shared to keep costs down and when many customers are active together there may be a reduction in bit rates. Service providers have tariff options for various speeds and Mbytes per month. Email and internet web browsing are the usual intended use. For applications requiring substantial uploading of data or for real time both way video or VoIP ask about higher price options and feasibility. My text summary for each satellite internet access service provider. These are not paid-for adverts. Details of suggested companies are at my discretion and may be removed. Click on emails against all suitable coverage maps for current prices and to confirm technical details. There are more companies, with separate pages, listed lower down. Look at these as well. If you want your company added please tell me about what you do, beam coverage maps etc. There is no charge. This is not a paid-advertising page.Updated details tend to get moved to the top. This company's aim is to ensure that designed solutions take into account the short, mid and long-term development requirements of our clients businesses. This provides network longevity whilst minimizing the overall costs of hardware and satellite capacity for future link upgrades. Beamsat have an in-house team to assist with Network Design, Link budgets, Site Surveys, Network Monitoring and Network Support. Services include shared and dedicated internet access, SCPC, mesh, maritime mobile, broadcast, TV and radio. Technologies: iDirect, Newtech, Comtech and Novelsat. Minimum hardware: Fixed: Ku:1.2m or C:1.8m dish. Mobile/broadcast receive Ku: 60cm dish. C: 1.2m dish. Lepton Global Solutions provides customized, end-to-end satellite communications solutions for both military and commercial customers utilizing Ku-, Ka-, C-, and X-band satellite frequencies. Example, coverage using Eutelsat 70B Widebeam in the Middle East and North Africa, including Libya, Egypt, Iran, Iraq, Kuwait, Qatar, Jordan, Turkey, Israel, Lebanon, and Syria. Lepton Global's solutions include fixed VSATs, rapid deploy terminals, and COTM (communications on-the-move) systems. Solutions are available for all world regions, making use of multiple satellite beams and bringing together resources from a number of different suppliers, appropriate to the individual customer requirements. My review. Address: 8381 Old Courthouse Road, Suite 200, Vienna, VA 22182 USA. Example coverages, with emphasis on the Middle East. GlobalTT is a privately owned teleport company, based in Belgium, with more than 25 years of experience. 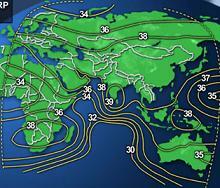 They provide coverage of the Middle East using Arabsat 5C. 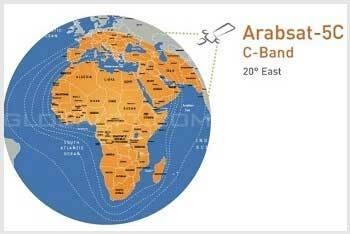 Arabsat-5C (EAST) - C-band: Coverage, as illustrated, includes: Algeria, Libya, Egypt, Saudi Arabia, Yemen, Oman, Iraq, Iran and Turkey. C-Band equipment: Suitable for medium to large offices (10 to 200 computers). All iFast Vsat stations are available from stock and can be shipped within 24 hours. Shared access (4:1) or (2:1) and dedicated access. Up to 4 Mbps in upload (Transmit) - 10 Mbps with the proper license. Price: from 650 USD up to 12 000 USD/month. GlobalTT take care of all shipment, installation and activation. Options available: VOIP (Voice over IP), public IP, VLAN, vehicle solution, maritime solution, drone solution, Transportable, Telephony. For higher resolution details of individual Middle East satellite beam coverages, click on the world coverage map to go to a detailed interactive map at the Isotropic web site. Ku Hughes HX50 and iDirect Evolution x3 on Eutelsat W6 satellite at 21.5E. Eutelsat W7 satellite at 36E. SESAT 2 (Express AM22) at 53 East. Hughes HN9200 service. Due to start 2Q2012. iDirect Evolution x3 and Hughes HX50 service: Your dish: 98cm - 1.8m diameter according to location. Outlink: 512 - 2056k - 4Mbit/s. Choice of three orbit positions now with coverage of Europe, North Africa, MENA, Iraq, Pakistan, Afghanistan, Tajikstan, Kyrgystan, Western India and Turkmenistan. Hylas 2 is due to be launched in early 2012 and will be used to provide small dish Ka band service using Hughes HN9200 modems. iDirect in the Middle East using Eutelsat W6 beam.
. iDirect, LinkStar, DVB-S2, SCPC and FR platforms - shared and dedicated links of any possible configuration.
. Ready to support business-class VoIP and Videoconferencing, VPN (IPSec), Mesh topology and more.
. Individual QoS setup per each VSAT system to make sure your own applications traffic are prioritized .
. Immediate Spare Parts Replacement Warranty option, in-country Installation and Maintenance options.
. Ability to connect with your own equipment, flexible migration deals, APO delivery... and more!
. Free VoIP phone and calls to the USA. All ex-USSR (CIS), including Ukraine, Russia, Armenia, Azerbaijan, Moldova; MENA, including Iraq, Afghanistan, Lebanon; All Asia, including: Pakistan, Bangladesh, India and Thailand. Contact: vsat-satsigs@bcsatellite.net to inquire for more information and prices. MM Telcom offer one stop shopping for equipment and service. MM Telcom is an American company serving Business, Enterprise, NGO's, Educational, Military or Government. Providing high speed internet (e.g 9.0 meg downlink, 4.2 meg uplink), quality VoIP, video, distance learning and multi-casting capabilities. Running VOIP? Using additional compression equipment with proprietary algorithm MM Telcom can compress VOIP into 4k per channel, obtaining the equivalent of (30 lines) E1 using only 128k! (4k per voice). No download quota or limits. Excellent warranty: if equipment is down then your monthly billing is stopped. 24/7 tech support engineers in USA and Europe. CorpSkies: Provider of satellite communications, internet via satellite, VoIP, video and wireless access. This company, with 17 offices in the MENA area, makes use of Arabsat / BADR satellites, plus others from Eutelsat and Intelsat, to deliver service throughout the Middle East and North Africa. The emphasis is on reliable data, video and VoIP, with data rates from 64kbps to 155 Mbps, either dedicated or shared, symmetrical or asymmetric, as required by the client. IP is used to provide internet, data and images for the entire region. Private data/voice networks are available for corporations and government organisations with multiple branch operation. WIMAX is used to deliver into local area networks for branches and sites up to 50km apart. WAFA offer access services in the MENA area and elsewhere using HughesNet, iDirect and Linkstar equipment. 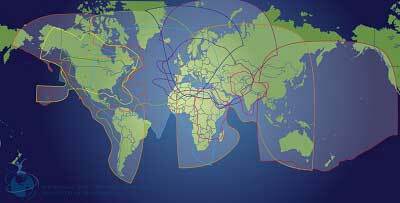 Satellite coverage areas include Africa (Western, Central , South Africa, Libya, Algeria), Lebanon, Saudi, Iraq, Bahrain, Kuwait, Qatar, Oman, Western Europe, Eastern Europe, Afghanistan, Pakistan and India. LinkStar and iDirect services may also be used for VoIP connection - suitable for internet cafe, business or residential. More details. Tell them where you are located and ask about what services you require. Typical dish size 1.2m diameter. Click on the logo banner above to go to their web site. Including Iraq, Iran, Afghanistan, Saudi Arabia, Yemen, Oman, Qatar, Kuwait, Jordan, Syria, Lebanon, Turkey, Israel, Egypt, Azerbaijan, Armenia as well as Western Russia, Ukraine, Kazakhstan, Georgia and Cyprus.
. DVB/RCS ViaSat LinkStar MF-TDMA platform.
. Access services for SOHO, SME and Internet Cafe.
. Broadband bandwidth up to 4 Mbit/s, 1:10 and 1:20 sharing ratios. With delivery, licensing and professional installation services. Click on the logo banner above to go to their new web site. Using their own large teleport hub dish in Cyprus, DigitalSkys provide an iDirect VSAT service all along the North Africa coast, Egypt, Saudi Arabia, Iraq, Baghdad, Turkey and surrounding area. They offer a service also around Afghanistan, Pakistan, Kashmir, Hindu Kush, Western India and Tajikstan area using the NSS703 satellite. Tariffs and equipment suitable for single PC users, small business, large business and military (DES iDirect modems) are available. Local wireless extensions for up to 50km are available using 802 standards. The customer VSAT terminal comprises a parabolic antenna dish, similar to satTV, together with an indoor modem box unit. Ethernet cable links one or more local PCs. You may normally add wired or wireless router to connect many PCs or VoIP phones. The arrangement is suitable for both home use and for small office applications. If you want to connect many IP devices you will need a higher capacity tariff or lower sharing ratio - otherwise your link will be congested. The outdoor radio modules on the front of the dish receive the outlink (or downlink) using a conventional satellite television LNB (low noise block downconverter) and transmit the return link (or uplink) data to the satellite using a transmit block up-converter (BUC). The wireless service is always-on direct access and not dependant on dial up or ADSL lines. The large teleport hub station is where the VSAT Operator and ISP providers are located with a high speed digital backbone for worldwide networking connectivity. Ku band refers to 11/14 GHz operation. C band (4/6 GHz) needs generally larger customer antennas but suffers less from heavy rain fading in the tropics. Ka band refers to 20/30 GHz operation using high throughput satellites (HTS) with multiple small spot beams, providing lower cost, smaller dish access, but with higher risk of outage in high rainfall events. Have your say. Write your message now in my Satellite Internet Forum. Help others with advice, contribute your problems, successes, failures, wants, sales. Please e-mail me, Eric Johnston if you have problems with this page. This web page is intended to be helpful, it does not use flash, cookies, pop-ups or other nonsense. The setting up and control of VSAT terminals is controlled from the teleport hub station so any problem sites can be switched off remotely until a technician attends. Also, the equipment design and frequency bands comply to international regulatory "type approval" for general use so that operation does not cause interference to other services. Non-approved terminals require individual valuation and licensing. 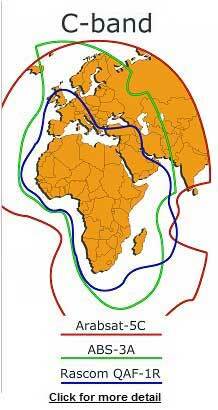 Import/export regulations restrict use of VSAT equipment in some countries. Technical coverage areas do not imply that operation is allowed everywhere within the beam. Country border lines are approximate. Elsafeer iDirect Evolution X3 service in Basra Iraq. Images are displayed with permission of the respective companies. Requests for deletions and additions welcome. There is no charge.